Many of these are old friends, but I really appreciate being reminded of them, having them all together like this. Some are humorous, some are poignant, some are paeans to nature; some are structured and rhyme, some are brimful of word-play, some are free verse. The line drawing illustrations are charming, too.And then there are the poems that are new to me:I copied "Little Talk" by Aileen Fisher into my review of Are We Smart Enough to Know How Smart Animals Are?.from Marchette Chute's _*Spring Rain*_My hair is wet, my feet are wet, I couldn't be much wetter.I fell into a river once But this is even better.Chute also sees snowflakes as 'baby stars. 'Eleanor Farjeon is one of my favorite authors, so I'm thrilled to find:_*The Night Will Never Stay*_The night will never stay,The night will still go by.Though with a million starsYou pin it to the sky;Though you bind it with the blowing windAnd buckle it with the moon,The night will slip awayLike sorrow or a tune. 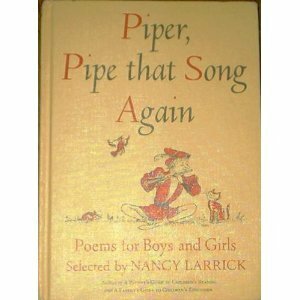 Piper, pipe that song again 4 out of 5 stars Larrick uses nature as the main focus and theme throughout the book. Nearly all of the poems are about nature, ranging from ducks, ponds, seas, foxes, pelicans, pigs, bears, and much more. On the front of the jacket, there was a little note about why the poems were selected. This helped to add clarity to the text, because the reader was able to relate the text to the information on the jacket. Some of the poems rhymed, but not all of them. Almost all of the poems spoke of concrete images and ideas, such as the aforementioned nature items. Oechsli’s illustrations are similar to Shel Silverstein’s; simplistic illustrations of ink that clarify the text while adding humor simultaneously. The book seemed to be a mixture between poems about nature and comical poems with a message. An example of a poem with a message was one about a boy who made mustard-flavored custard, and that young boys should not cook alone. I gave the book four out of five stars, because I enjoyed the rhyming poems and sometimes silly illustrations. I think the history contained on the jacket is helpful information for the reader as well. I would have liked to have seen a bit more variety in the book, besides poems about nature. The reading level for this book would be between first and fourth grades. Some of the poems ask the reader to think deeper, which is why kindergarten was excluded. I think students could connect with some of the ideas in the book, such as a child who is afraid to swim and clings to a rock or how going to bed can be procrastinated. Two subject areas into which the book could be integrated could be science and math. For a science lesson, students could read the poem entitled, Undersea. We could discuss some of the creatures that live under the sea mentioned in the poem, such as oysters, jellyfish, and dolphins. Mermaids are mentioned as well, and we discuss the line between fact and fiction. This collection of poems, originally published in England in 1965, has a distinct style, it certainly feels British. A collection of rhyming, narrative poems. Poems are about a variety of topics, mostly nature and every day life. Each poem is told in first person narrative. Lovely, hand-drawn illustrations accompany some poems. Setting is shown through descriptive language, as well as illustrations, but is not evident in every poem. While each poem has a clear theme, there is not theme throughout the book. Selecting poems with a more unified theme would have strengthened the book as a whole. That being said, the language, illustrations, and tone of the book are enjoyable to read. If I were to include this book in my classroom, I would use it as an introduction to poetry. Sometimes young students' have a negative view of poetry because it isn't taught often or in depth, and with the idea that there is one correct interpretation. In my classroom I would use this book by simply selecting some poems and reading them aloud to the class, without asking them to analyze it too thoroughly. Later in the course I would include other books of poetry, and this book would have served as an introduction to the subject. This book survived my own childhood and I was pleased to read it over and over again to the next generation. Fun poems, classic poems, lighthearted and tongue twisting poems----these are the ones that draw kids in and create a love of language. My favorite? "Daddy Fell into the Pond," by Alfred Noyes. Wonderful way to introduce poetry to kids. Our family loved this book. When we had a stack of books to read together, this was almost always the first my little man asked me to read to him. And then he didn't want me to stop and would keep asking for more.